Building a successful brand image is about being at the right place at the right time. And currently that right place looks a lot like Instagram. With an estimated 70% of brands on the network, it’s no wonder why companies continue to look for ways on how to schedule Instagram posts and ultimately produce great content. Just as you would on any other social media channel, learning how to schedule Instagram posts has become a vital role for strategists. However, having ideal Instagram scheduling leads some marketers to invest in multiple social tools. We’re here to nix that and show you how to schedule Instagram posts with Sprout Social so all of your social media engagement, publishing and analytics tools are all in one place. To schedule Instagram posts, you have to use a social media publishing tool like Sprout Social. We make it easy to upload your image, finalize your content and schedule it. Simply schedule your post from Sprout, and when it’s time to post you’ll receive a push notification from our mobile app. When you get the notification, tap the “Share on Instagram” mobile button to send the post to the native Instagram app. There you simply paste the caption (which is automatically copied to your clipboard after you tap to share) and make your final edits to the post. The first step to scheduling Instagram posts is generating great content. This starts with you creating your image to post. If you need help with what to publish, check out our guide on Instagram post ideas. 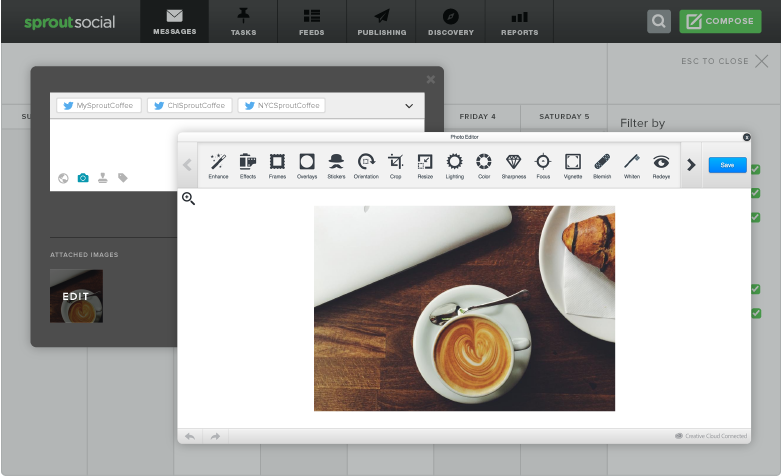 Through Sprout’s publishing toolset, you can easily upload your Instagram image on all Sprout plans. Additionally, you don’t have to schedule your post to just Instagram. The fully integrated feature lets you schedule to LinkedIn, Twitter, Facebook and Instagram at the same time. After you upload your perfect Instagram picture, it’s time to edit your image. In the Compose section, Sprout provides you with an integrated Image Editor tool from Adobe Creative SDK. Here you can crop, add effects, overlays, change lighting, focus and much more. Instagram is commonly known as a place for creative content. Make sure you don’t bore or post hastily-edited images to your profile. Users recognize when your content is polished and looks its best. To increase your shares, likes and comments, make sure your posts go through a thorough round of edits before going live. Once you’ve edited your content, it’s simple to select what account you wish to post. 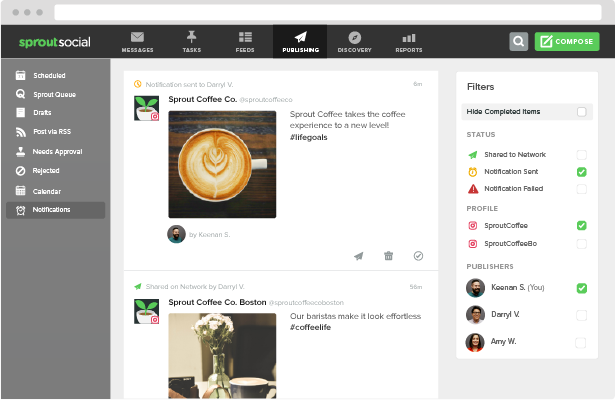 Sprout allows you to manage multiple Instagram accounts when scheduling your content. This makes it much easier to not only select your preferred Instagram account, but other social networks connected to your Sprout dashboard as well. For many businesses, there’s a need to publish to multiple Instagram accounts. Managing the publishing for these accounts requires the content creator to receive content approval, coordinate the post’s timing and ensure that someone is logged into the correct account to publish the post. 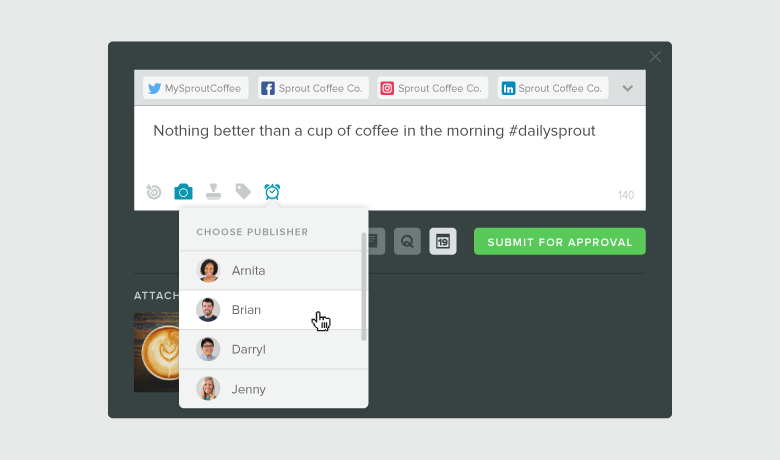 Luckily with Sprout, your social media team can select a designated publisher for each post to receive the push notification reminder when it’s time to post. Click on the alarm clock icon in the compose window to select your publisher. This process helps companies delegate publishing duties for multiple accounts and decide who will publish the post at its scheduled time. Draft: Not sure if you’re ready for this type of Instagram post? What if you want to create multiple posts ready to publish at any time? Draft is a great spot to put your unfinished content or things that still need approval. Queue: Placing content in the queue is ideal for edited posts ready to go live. Some content might seem appropriate on certain days or you could simply get Instagram images ready for the weekend in queue. When you queue your Instagram posts, Sprout will pick the best time to publish within the window you specify. Schedule: Using the schedule feature when you want to publish your Instagram posts at a specific time. This is great for when you’re launching an Instagram contest and want the post to go live right when it starts. It’s also helpful if you’re scheduling an Instagram post as a part of a larger campaign, and need content to go out at a specific time of the day. 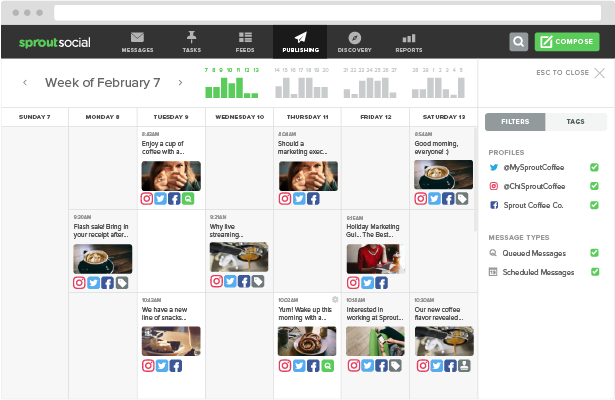 Plan finished content for the future and see your scheduled posts in Sprout’s social media calendar view. Submit for Approval: Choosing an approver ensures your content is properly edited, grammatically correct, timely and on brand. Select specific approvers to review your content before it goes live. Send: If you don’t need an approval process and are ready to publish right away, simply click send. 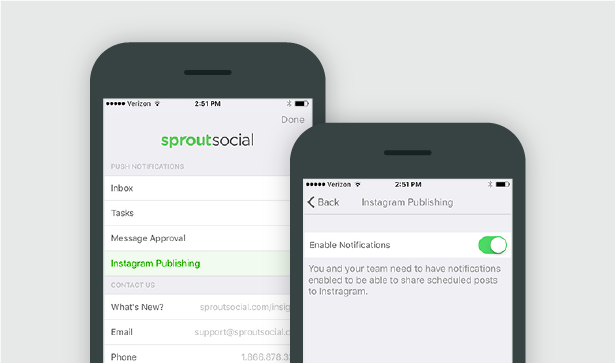 For those scheduling or submitting an Instagram post through Sprout, you’ll receive a mobile notification at the selected time or immediately after clicking Send. Because Instagram’s API doesn’t allow for other platforms to post directly to its network, Sprout has developed a notification system that takes the pain out of scheduling content. To receive these alerts, you have to set select “Allow Notifications” on your mobile device. All alerts for scheduled content will be sent out to the appropriate users. 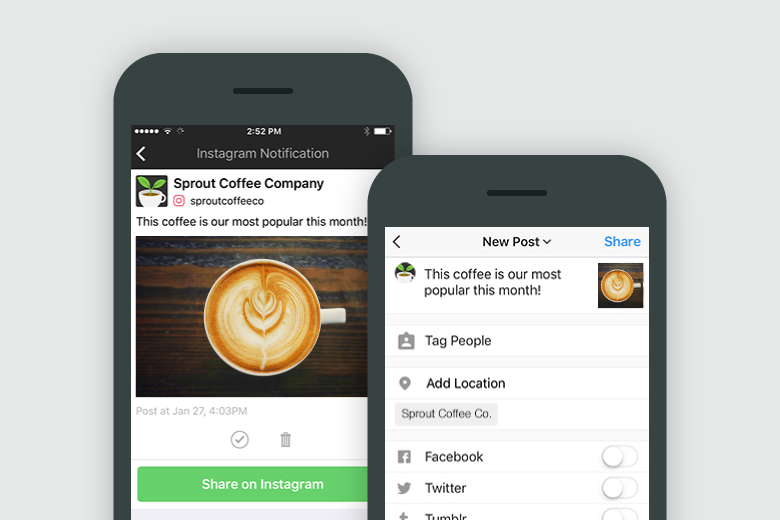 From the notification, you can easily click into Sprout’s mobile app to send the image to Instagram. Once you’re back on the mobile app, you simply click Share on Instagram and your image will then be directed to Instagram’s platform. This transition is easy and painless for mobile users. Prewritten Instagram captions are copied to your clipboard and pasted into the Instagram caption field. All you have to do from here is finalize your content, add a specific location or tag users (if desired), finalize any image edits and click Share on Instagram. The process is quick and easy for brands looking to schedule Instagram posts. Save time and money on your Instagram scheduling efforts through Sprout Social. Want to give it test run? Sign up for a free 30-day trial to use Sprout Social’s Instagram Scheduling tools. Scheduling Instagram content is simple, but knowing what image resonates with your audience can be more challenging. Sure, you can track vanity metrics such as likes and comments. 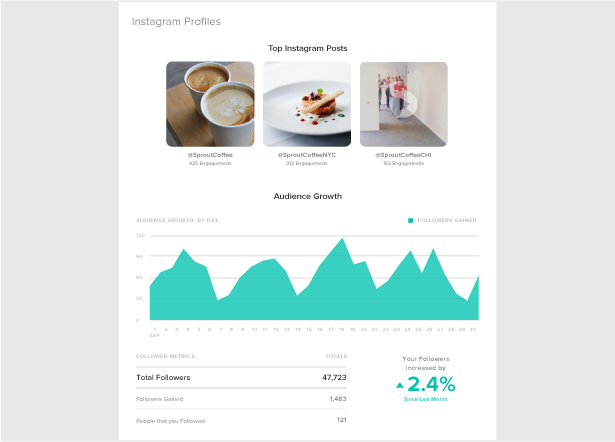 However, using Instagram analytics tools allows users to track and monitor hashtags, posts and comments all within a single inbox. Learn how to reach your Instagram audience more effectively so you produce the best and most engaging content.